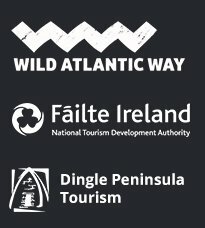 Wild Atlantic Way Guided Walk – Dingle Style. A wild atlantic way guided walk is a potential trip highlight of any visit to the Dingle Peninsula, Kerry on the south west coast or Ireland. Rugged coastline, fabled off-shore islands, West Kerry Hills, western skies and the great Atlantic all conspire to make this magic stretch of coastline, inch for inch, one of the crown jewels of the Wild Atlantic Way. Discover the magic of the Atlantic Ocean at it’s purest as it caresses and crashes against the rocky coastline of the Dingle Peninsula and the Blasket Islands. Take some time to observe the western skies as the sun and clouds perform their eternal dance. See the light changing, off-shore islands and distant headlands disappearing and reappearing before your eyes. There are sea birds, plenty of sheep and even the occasional passing whale. Epic, this Wild Atlantic Way Walk is like a movie set. In fact it was the movie set of Ryan’s Daughter (1969) and more recently Star Wars. But deeper than that , this is prime gaelteacht (Irish speaking area), fully connected to tradition and rich in story both historic and imagined. Pagan goddesses, extreme early Christian monks, marauding Vikings, wrecks of the Spanish Armada, rebel norman poets, Blasket Island storytellers all contribute to the story of a landscape that never fails to inspire. Please contact us here to make further enquiries or to book the Wild Atlantic Way guided walk. Your guide for the day, Kevin O’Shea, is a Failte Ireland approved local area guide. Kevin believes the best way to truly experience the Dingle Peninsula is to grab a coat and some boots and get out and walk it. Access the special places on foot. Timewise this is a flexible walk and can be shortened or lengthened. Generally with a ten o’clock pick up in Dingle we are back in Dingle circa 4.30pm. To get the most from the experience treat it as a full day activity and this could be one of your trip highlights! We look forward to hearing from you.